Seismometer self-noise is usually not considered when selecting and using seismic waveform data in scientific research as it is typically assumed that the self-noise is negligibly small compared to seismic signals. However, instrumental noise is part of the noise in any seismic record, and in particular, at frequencies below a few mHz, the instrumental noise has a frequency-dependent character and may dominate the noise. When seismic noise itself is considered as a carrier of information, as in seismic interferometry (e.g., Chaput et al. 2012), it becomes extremely important to estimate the contribution of instrumental noise to the recordings. Noise in seismic recordings, commonly called seismic background noise or ambient Earth noise, usually refers to the sum of the individual noise sources in a seismic recording in the absence of any earthquake signal. Site noise (e.g., cultural sources, nearby tilt signals, etc.) and noise introduced by the sensitivity of an instrument to non-seismic signals (e.g., temperature and pressure variations, magnetic field changes, etc.) both contribute to the ambient seismic noise levels. The background noise ultimately defines a lower limit for the ability to detect and characterize various seismic signals of interest. Background noise levels have also been found to introduce a systematic bias in arrival times because the amplitude of the seismic phase must rise above the station’s noise levels (Rӧhm et al. 1999). The upper limit of useful signals is governed by the clip level of the recording system (the point at which a recording system’s output is no longer a linearly time-invariant representation of the input). Site noise can be reduced by careful site selection (e.g., hard rock far from strong noise sources) and by emplacing instruments in good vaults or boreholes. It is also possible to reduce sensitivity to non-seismic signals by thermal insulation and appropriate shielding such as pressure chambers (Hanka 2000). At quiet sites with well-installed instrumentation, instrument noise may be the dominant noise source (Berger et al. 2004); this is especially true for long-period seismic data (>100 s period) on very broadband instruments (e.g., Streckeisen STS-1 seismometer). The interpretation of such data only makes sense if the instrumental noise level is known. Also, research on noise levels in seismic recordings, the effect of noise reduction by the installation technique, and the nature and contribution of different noise sources to the recordings require knowledge of instrumental self-noise to rule out bias from the instrumentation self-noise. A number of tests have been developed, under the assumption that instrument self-noise is approximately constant as a function of time (e.g., Evans et al. 2010; Holcomb 1989, 1990; Sleeman et al. 2006). Only recent studies have started to look at the potential time dependence of instrument self-noise (e.g., Sleeman and Melichar 2012). Understanding the self-noise of a given piece of recording equipment helps station operators to better identify sites that can take advantage of low-self-noise instruments. This knowledge also allows a network operator to provide higher-quality data with limited resources by making better use of their high-quality instruments. Having a rough understanding of an instrument’s self-noise also gives a first-order diagnostic for determining if the recording system, as installed, is performing satisfactorily. In order to estimate the self-noise of a seismometer, it is necessary to remove non-instrumental noise signals (e.g., earthquakes and ambient Earth noise) from the data. This is often accomplished by using coherence analysis techniques. In its simplest form, one can select a quiet time period at a low-noise site and attribute all recorded noise to the sensor (one-sensor method). However, it can be difficult to find stations with sufficiently low site noise to evaluate high-quality broadband seismometers. This is especially true at periods between the primary and secondary microseism (approximately 4–22 s period). In such cases, more sophisticated techniques, where one removes coherent signals using colocated instruments, are required. This can be done using a second instrument or two additional instruments (two- and three-instrument methods). For passive sensors, it is possible to obtain an estimate of the self-noise by locking the mass of the instrument. This is a general overview on the various methods currently used for estimating the instrument self-noise when using one, two, or three sensors. As there is no universally “best” method for all types of instruments and test conditions, some of the advantages and disadvantages of each method are discussed. Variants of these methods, such as rotating horizontal components of Earth motions to maximize the coherence and correcting for misalignments, are also included. Finally, the test setup used for estimating self-noise for the various methods is discussed and examples of corresponding test results are given. To discuss the various methods currently in use for estimating the self-noise of a seismometer, a mathematical framework common to all the methods is developed. The system under test is assumed to be a linear time-invariant system (LTI) making the system completely determined by its impulse response (Scherbaum 2007). Finally, it is assumed that all of the instruments in the test have common output units so that they have similar ground motion units (e.g., m/s or m/s2) after removing the instrument response. This assumption can generally be made true by using an “omega correction” (multiplying or dividing by ω = 2πf, where f is the frequency) in the frequency domain (Stearns 1975). Noise levels are often compared to absolute Earth noise models such as Peterson’s New Low-Noise Model (NLNM) and New High-Noise Model (NHNM), which are global seismic noise models derived from the 74 Global Seismographic Network (GSN) stations along with one additional station (Peterson 1993). This NLNM represents the lower envelope of 2,000 data records and represents an approximation of the lowest observed seismic noise levels, whereas the NHNM represents the upper envelope of the same 2,000 data records and represents an approximation of the highest observed seismic noise levels (Fig. 1). assuming that X i ≪ N ii . Even when this assumption is not satisfied across the entire frequency band, it is often possible to get an initial estimate of the instrument’s self-noise in a specific frequency band (e.g., outside the primary and secondary microseism bands for state-of-the-art accelerometers). The single-sensor method can also be used to get an upper bound on the self-noise of an instrument. If this upper bound is obtained at a relatively quiet location, it might characterize the self-noise sufficiently well to identify the suitability of an instrument at a station with potentially much higher site noise. This method gives a first approximation of an instrument’s self-noise, which can be valuable when testing time is limited or there are insufficient resources to use multiple sensors. where again they assume the signal-to-noise ratio is large. Using three colocated sensors, it is possible to estimate the self-noise of each instrument while minimizing errors in the estimate due to uncertainty in the transfer functions (Sleeman et al. 2006). This method has become the preferred approach for estimating self-noise for broadband sensors, even though it requires additional resources and setup; it typically “sees through” site noise more deeply to extract lower estimates of instrument noise. The term P ik /P jk can be viewed as a “relative transfer function” H ij between instruments i and j. The three-sensor method is related to the two-sensor method developed by Tasič and Runovc (2012) when one compares relative transfer functions. It is important to note that the transfer function of instrument i is only used to convert the noise estimate to units of ground motion; thus, errors in the transfer functions do not propagate to the self-noise estimate before deconvolution with the individual instrument (Ringler et al. 2011). Because the three-sensor method is not as sensitive to errors in the transfer functions, it extracts the self-noise with a potentially higher accuracy than the two-sensor method (Fig. 3). When instrument designers are selecting components for building a seismometer, they often have noise estimates for each electronic component as well as estimates of fundamental noise contributions (e.g., Brownian noise). Through modeling these individual noise sources, it is possible to estimate the total self-noise of a seismometer without having a working prototype. A modeling example for Brownian noise is described by Aki and Richards (2002), using the physical parameters of a simple gravitational pendulum. Such methods often give a first approximation of the instrumental noise to be aimed for during design (Fig. 4). Such theoretical methods for estimating the self-noise of an instrument have been applied to a number of seismometers in conjunction with their digitizers (Rodgers 1994). However, when such methods are used, a number of assumptions must be made (e.g., that the pendulum obeys the small-angle approximation and all electronic components perfectly match their specified noise levels). For seismometers that are not controlled by feedback but having self-noise well below any available test site’s ambient noise, such as geophones at high frequency (e.g., GeoTech GS-13), it is possible to estimate the self-noise using a “locked mass” test (Havskov and Alguacil 2004). This test is performed by locking the mass of the instrument and recording the output of a single instrument. This test provides a lower noise-bound estimate but may not fully characterize the self-noise of the instrument because it lacks noise contributions from moving hinges and other mechanical sources. Characterizing the self-noise of a seismometer requires attention to detail in the test setup, careful selection of data windows to avoid transients, identification of potentially non-seismic noise sources, and methods for selecting data to analyze. In both the two- and three-sensor methods, it is necessary to make sure all instruments truly are recording the same ground motion. Both the two- and three-sensor methods assume that all instruments are recording the same ground motion. In order for this to be true, it is critical that the instruments be colocated and co-aligned. Furthermore, since local tilt signals can vary widely over even a few inches, one must take care to insure that all three instruments are measuring similar tilt signals so that they can be removed using coherence analysis. Locating all instruments on a stiff slab (e.g., granite or gabbro) with a three-point suspension is usually sufficient for this purpose (Fig. 5). It is also important to isolate the instruments from non-seismic noise sources (e.g., temperature variations, pressure variations, locally induced tilt). These noise sources can increase the self-noise estimate of the individual instruments as they generally do not respond coherently to such sources (Anderson et al. 2012). Misalignment of the horizontal components can also contribute to a decrease in signal coherency and increase the estimate of the self-noise. Such relative errors in misalignment can be seen by elevated incoherent noise-level estimates in the microseism band (Fig. 6), so it is possible to reduce such misalignment errors by rotating the instrument outputs numerically to maximize coherence (Tasič and Runovc 2012). Recent work by Gerner and Bokelmann (2013) shows that the leakage of microseism signals into the self-noise can be eliminated successfully by numerical rotation of the three-component traces and using the three-sensor method. Their study optimally aligns two RefTek 151-60A sensors with a third one and shows that self-noise estimates outside the microseism bands are not compromised by misalignment errors. Finally, if one wants to isolate the self-noise of a seismometer, it is critical that the digitizer and other recording equipment have self-noise levels well below that of the sensor. This can be a problem on low-gain instruments, such as strong-motion accelerometers. Verifying that the digitizer’s self-noise levels are below that of the seismometer requires a terminated-input test of the digitizer, using a terminating resistor similar to the output impedance of the sensors to be tested. When the digitizer’s noise level is not below the seismometer noise level for any of the frequency range of interest, digitizer preamps generally can be used for low-noise amplification of the sensor signal to a level above the digitizer noise level. Data selection is currently an important item in the development of algorithms and techniques to estimate self-noise. This requirement makes it necessary to estimate self-noise noise during only “quiet” time periods (e.g., during nighttime and periods with low pressure-induced tilt noise). No current agreement exists as to whether data selection should be applied or not, or which criteria should be used for data selection. In particular, when features in the data are not fully understood, the debate on data selection is ongoing and not yet entirely resolved, though a best-case result seems to require such minimization (Ringler et al. 2011). For example, the occurrences of periodic pulsing in the data are not yet understood (though many have been named “popcorn noise,” “spherics,” and so forth and are tentatively explained in various ways). Some of these noise sources could properly be considered either as part of the self-noise of the instrument or as transient external signals that would artificially elevate the self-noise if included (Sleeman and Melichar 2012). The discussion on data selection of time segments becomes even more controversial when limited amounts of data are available. By using multiple quiet time segments, it is possible to understand the self-noise of an instrument in at least a best-case scenario (Ringler and Hutt 2010). One such example of a best-case scenario, along with a self-noise estimate using the median of multiple tests, is shown in Fig. 4. This example also suggests that even when using coherency analysis techniques, it is important to do such tests in a low-noise environment. The selection of time segments is additionally controversial when limited amounts of test data exist, because the assumption that the self-noise of a seismometer is time invariant is only approximately true, as seen in the relatively large gray bands in Fig. 1, which depict the 95 % and 68 % of the self-noise of the Streckeisen STS-2 seismometer as recorded under very stable conditions at the Conrad Observatory (Vienna, Austria) over an entire year. A synthetic-data experiment by Sleeman and Melichar (2012) shows that the three-sensor technique can reliably extract instrumental noise even for high “seismic-signal-to-instrumental-noise (SNR)” ratios, but is in practice limited to lower ratios due to misalignments or mis-leveling between the sensors. As discussed earlier, small alignment or leveling differences between the sensors decrease the coherency between the recordings and thus affect the noise estimate. It was found that an alignment error of 0.2° in any axis allows the technique to extract self-noise for SNR values up to 60 dB, which was confirmed in their associated experiment using real data. As this order of misalignment between corresponding axes in similar colocated sensors is in agreement with the precision of best-practices manufacturing, one should only use data taken during “quiet” time periods (SNR below 60 dB, e.g., during night and periods with minimal pressure-induced tilt). Even during these times, microseism noise can make it difficult to estimate the self-noise of broadband sensors in the period bands of 4–8 s and 18–22 s for instruments (Ringler et al. 2011). As in any time series analysis, appropriate time window lengths, number, and overlapping must be used to resolve the low frequencies of interest while minimizing variance. For very broadband seismometers, it is often of interest to understand the self-noise for periods up to several thousands of seconds, which corresponds to a total window length of at least 8 h divided into overlapping sub-windows, each of about an hour (e.g., Table 1 of Evans et al. 2010). To directly compare results between noise tests, it is important that the tests be conducted using similar methods (e.g., settling time, installation methods, data selection, and spectral processing parameters). A discussion on the expected self-noise results for various types of seismometers now follows. This discussion is in no way exhaustive but simply discusses some of the more common situations and what is generally expected for various test scenarios. The noise levels of strong-motion accelerometers make estimating the self-noise of such sensors easier than typical low-noise broadband sensors (Fig. 2). Since the user community is generally only interested in strong motions with frequencies from a few Hz to a few tens of seconds period, it is often possible to resolve the self-noise using relatively short testing intervals. As noted earlier, one must be careful to make sure that the digitizer noise is below that of the sensor. Since strong-motion accelerometers are generally sampled at higher rates than broadband sensors (≥100 sps), it is necessary to identify the self-noise to much higher frequencies than for broadband sensors (Cauzzi and Clinton 2013). At these higher frequencies, it becomes more difficult to isolate the instrument from potentially non-seismic noise sources such as electrical power grid frequencies (e.g., 50 Hz in Europe and 60 Hz in North America) noise. At these higher frequencies, the coherency between recordings from colocated sensors presumably decreases, but this decrease in coherency is typically compensated by decreasing ambient noise and increasing instrument self-noise. After installing a broadband seismometer, it is important to let the instrument fully settle down from mechanical stresses that can build up during transport and adjust to temperature before attempting to estimate the self-noise. What constitutes an instrument that is “fully settled” is not well understood and currently a topic of some controversy. After the instrument has been allowed to settle, one can estimate the self-noise by using long-running quiet time periods (Hutt et al. 2010). Local changes in wind and pressure can introduce incoherent elevated noise levels on horizontal channels at long periods (e.g., >100 s period) as well as short (e.g., <1 s period). Although the process of self-noise measuring is not yet mature, the methods and techniques are rapidly improving. As manufacturers’ abilities to reduce sensor noise levels improves, methods for measuring the self-noise will also need to improve. A better understanding of the sensitivity of seismometers to non-seismic phenomena and techniques to thermally isolate the sensors (e.g., Fig. 7) or correct the data from these sources will be needed. Although there has been initial work on this subject (e.g., Forbriger et al. 2010; Zürn et al. 2007) with promising results, there is still much to be done before these methods become widely used by the seismological community. The above methods for estimating seismometer and accelerometer self-noise can be applied more generally to other instruments and recording systems. As the only assumptions are that all instruments will have a common input signal and output units, it is also possible to estimate the self-noise of digitizers (a “terminated noise” test), infrasound sensors (Hart et al. 2007), tilt meters, gravimeters, and rotational seismic sensors. In all cases, the general approach for estimating the self-noise will be similar, though the details may differ (e.g., test setup logistics, frequency band of interest, etc.). For a discussion on applying the three-sensor self-noise technique to digitizers, the reader is referred to Kromer (2006) and Sleeman et al. (2006). Details on applying self-noise techniques to other geophysical instruments are beyond the scope of this entry. 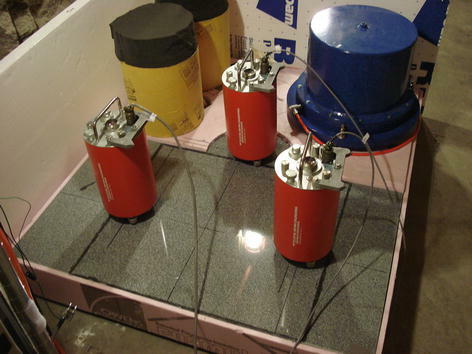 With the suite of various methods for testing seismometer self-noise, it is possible to get an initial estimate of the self-noise of a seismometer even in less-than-ideal testing situations. For instruments with relatively high self-noise, simple (one-sensor) self-noise methods may prove sufficient. Using additional high-quality sensors and more sophisticated techniques (two- or three-sensor methods) can help to eliminate common signals when there is concern of the local background noise being above the sensor’s self-noise. This will almost always be the case when testing broadband seismometers, but will not necessarily be the case when testing accelerometers though at least microseisms are above the noise floor of the state-of-the-art accelerometers even at an inland continental site. Equally important to the two- and three-sensor methods is that the common seismic signals be coherent among all instruments in the test. As discussed, this can be done by installing the instruments in a quiet vault on a granite slab or other stiff material to increase the coherence among sensors. Care should also be taken to reduce the influence on instruments under test from local non-seismic noise sources such as pressure or temperature variations and that adequate thermal settling time be provided before testing. Any use of trade, product, or firm names is for descriptive purposes only and does not imply endorsement by the US government.